Indiana, or the Gobi Desert ... ? Yes, this post's title does contains some hyperbole; but it's not just hyperbole. Our front lawn looks typical for this part of Indiana right now: brown and dry. The grass blades crunch underfoot. One neighbor takes the time to move a sprinkler around his yard at least once a day; but otherwise, the lawns in the neighborhood are faring no better than ours. I admit it: I was as excited as a little kid about last week's Styling and Refinement workshop with Andy Smith! (See Part 1.) The tree I took is a ponderosa pine, Pinus ponderosa, that I bought in Andy's Burlap Bonanza in 2010. (A bit of trivia: at the workshop, I was the only one working on a ponderosa that Andy had not brought with him on this trip.) Since receiving the tree in April 2010, I've done almost no pruning or pinching. My focus has been on building up my pine's health, and helping it acclimate to a moister climate and a significantly lower elevation than what it had known. When it produced strobili this spring (see this post,) I knew it was vigorous enough for its first major styling. Four days ago, the Fort Wayne Bonsai Club gathered at the home of our club president, for a Styling and Refinement workshop with Andy Smith. 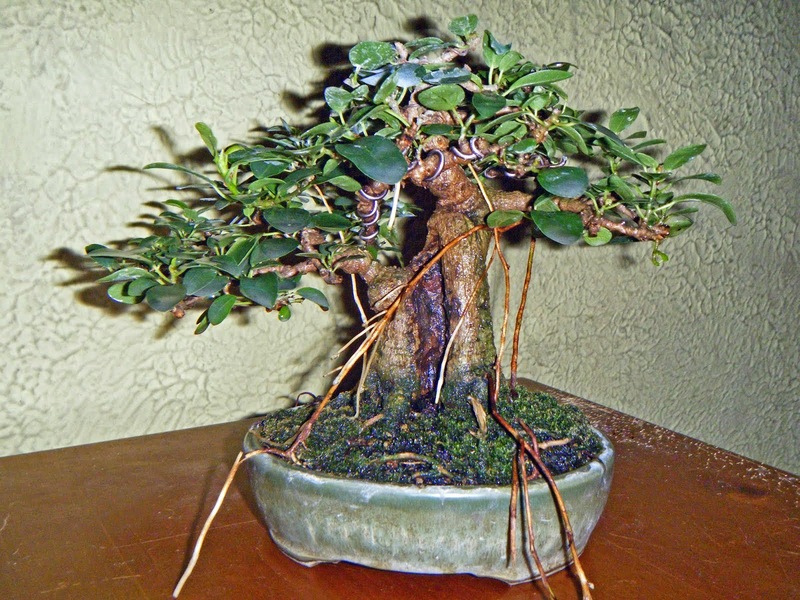 Andy is a bonsai teacher and artist, and one of the best-known collectors of native bonsai material in the USA. He and his two sons had attended the 2nd US National Bonsai Exhibition in Rochester, New York, and stopped on their way home to South Dakota. Time to Get Out and Shop! Sometimes the beauty of new foliage can almost match that of flowers. Here are a couple of recent examples among my own trees. In my last post, I described one of the two major bonsai projects that I tackled on Memorial Day (May 28.) The first was a graft; the other was my first use of the notch method to put a drastic bend in a branch. Colin Lewis describes this technique as one of the scariest he's ever used, and I can see why. For those not yet familiar with it, here's what you do.